It’s always a good idea to have a few “go-to” recipes that make good use of regional specialties. Especially if you’re entertaining out-of-town guests. Last night the divine Mrs. E. cooked a magnificiant meal and managed to sit down and visit with our guests all at the same time. Her secret is to prepare the main course and ingredients for the salad during the afternoon and preheat the oven just before the guests arrive. As we linger over cocktails, she pops the dinner in the oven and tosses the salad at the last moment. Like Ginger Rogers, who “did everything Fred Astaire did; only backwards and in heels,” Mrs. E. manages to plate and serve her Chicken Virginia, Spinach Salad with Walnuts and Raspeberry Vinegrette and local corn on the cob without wrinkling her white linen trousers. That qualifies as an easy and elegant dinner in my book. Mrs. E’s Chicken Virginia for Four. 4 thinly sliced chicken breasts or use boneless skinless breasts and pound them flat between two sheets of plastic wrap. Spray a non-stick muffin tin with cooking spray. Spread each chicken breast with Dijon mustard, salt and pepper. 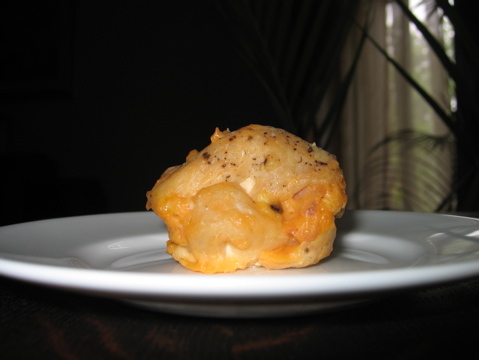 Sprinkle a little grated cheese inside and roll up into a ball, placing the stuffed breast into one of the muffin cups. (Optional sprinkle a little more cheese over the top. Cover with aluminum foil. Bake for 20 minutes. What does one do with the ham? And thanks for pointing out my omission. The ham is placed inside the chicken breast after spreading the inside with the mustard and before rolling the whole mess into a ball. Now this is an interesting and unique chicken recipe – I’ll give it a go! Thanks. BTW – I’m reading your blog from the beginning – it has wonderful content! Thank you Paul, It’s a crowd pleaser and quick to assemble for last minute guests. You may also stuff the chicken with all sorts of other fillings. Spinach and feta, for example.